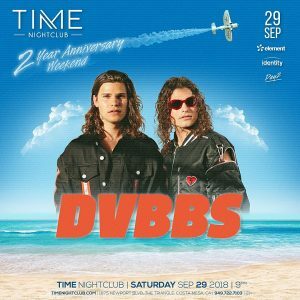 The electronic duo DVBBS (pronounced “dubs”) comprises brothers Christopher and Alex van den Hoef from Ontario, Canada. In the early stages of their career, the siblings joined forces with DJ Martin Sinotte, calling themselves Dubbs. In 2010, the group released the Generation Party EP and went on to tour with the likes of Steve Aoki and LMFAO. Sinotteleft the group in 2012, prompting the brothers to change their name slightly from Dubbs to DVBBS. Under the new name, they released the EP Initio, fusing a variety of influences in house, electro, reggae, and dub. Their first major success came in 2013 with the track “Tsunami,” a collaboration with DJ and producer Borgeous, released on Sander van Doorn’s label Doorn Records. The single went to the top of the Dutch charts and was also a major success in Germany, Austria, and Switzerland, climbing into the Top 20. A remix that featured Tinie Tempah, titled “Tsunami (Jump),” went to number one in the U.K. Dress Code| Upscale casual – No athletic wear, tank tops, shorts, backpacks, baggy or ripped jeans. No overly designed or offensive graphics.